WAILUKU — Two teams unaccustomed to playing for first place did just that on Saturday afternoon at War Memorial Stadium in Maui Interscholastic League eight-player football. The Lanai Pine Lads wake up today in first place in the league after a 36-23 win over Hana. 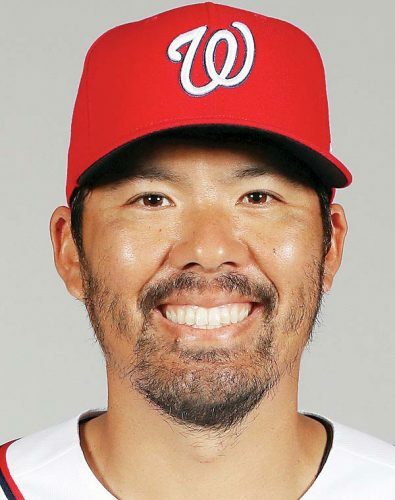 Both teams entered the game 1-0 in MIL play. The Pine Lads put the game out of reach when Devrene Kahananui-Alejado scrambled for a touchdown from 10 yards out with 1 minute, 52 seconds left to play. The final score was set up by a 39-yard pass from Kahananui-Alejado to Naighel Calderon. 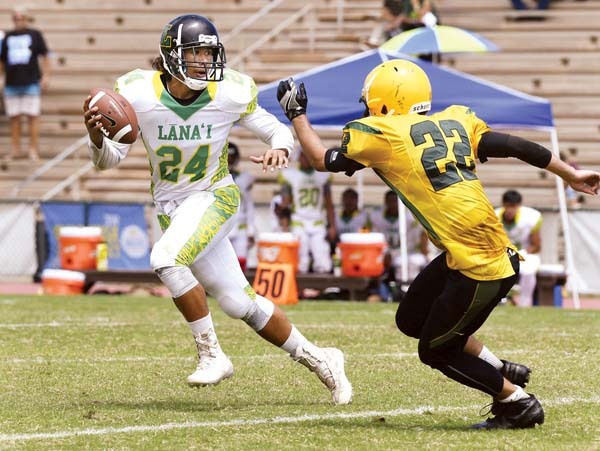 Lanai beat three-time defending MIL champion Molokai 44-16 last week. Kahananui-Alejado and Calderon were huge all game long. 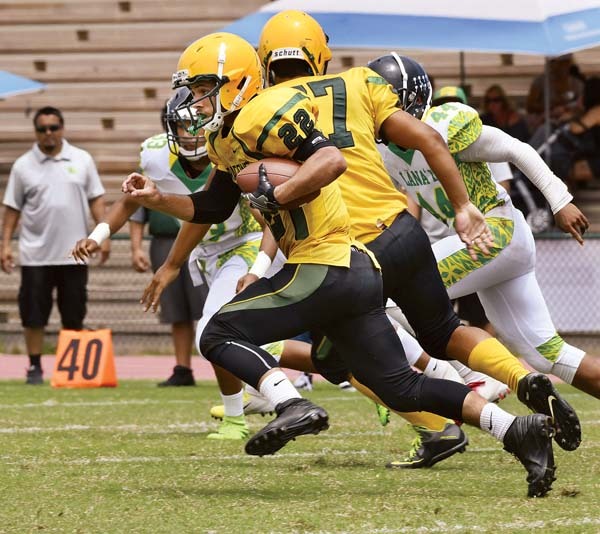 Kahananui-Alejado ran for two touchdowns and threw for three more — the junior quarterback also accounted for three two-point conversions. Calderon caught a touchdown pass, caught a two-point conversion pass and was large on defense. The Pine Lads took control with a pair of third-quarter touchdown drives after trailing by a point at halftime. Kahananui-Alejado rambled in from 19 yards out to give Lanai a 14-7 lead — the score capped a seven-play, 60-yard drive. Late in the third quarter, Roderick Noble hauled in a 42-yard scoring pass from Kahananui-Alejado to push the lead to 22-7 with 1:34 left. The big play on the drive was a 7-yard run by Calderon on fourth-and-6, moving the ball to the Hana 32-yard line two plays before the touchdown. The Dragons pulled within 22-15 when Nahinu Lind hit a wide-open Kaawaloa Shamblin for a 50-yard scoring pass in the first minute of the fourth quarter. The Pine Lads answered with a 70-yard drive that was culminated by a 9-yard scoring pass from Kahananui-Alejado to Jesse Sigrah, upping the lead to 30-15 with just under 9 minutes to play. The Dragons pulled back within a touchdown, 30-23, on a 3-yard scoring run by Lind with 4:30 to play. A 13-yard pass from Lind to Irie Pu-Akima moved the ball to the Lanai 6 two plays before the touchdown. The Dragons held a 7-6 lead at halftime — Hana struck first when Lind scrambled in from 15 yards out on a broken play to make it 7-0 with 2:32 left in the first quarter. The Dragons gained possession when Loea Helekahi recovered a fumble at the Hana 40-yard line. The Dragons then went 60 yards in 12 plays, converting third downs three times on the drive. Lanai answered on the ensuing possession when Calderon hauled in a pretty 40-yard scoring pass from Kahananui-Alejado on the first play of the second quarter on fourth-and-5. The Pine Lads came up short on their final possession of the first half after reaching the Dragons’ 18-yard line. The game ended with the Dragons in possession with the ball inside the Lanai 20. The first half was played under a modified running clock and there were only five different drives in the first half. The second half was played under a regulation clock. Ferguson smiled after the game when told his team is in first place. H–Nahinu Lind 15 run (Chanson Hoopai-Waikoloa kick), 2:32. L–Naighel Calderon 40 pass from Devrene Kahananui-Alejado (run failed), 11:52. L–Kahananui-Alejdo 19 run (Calderon pass from Kahananui-Alejado), 9:08. L–Roderick Noble 42 pass from Kahananui-Alejado (Kahananui-Alejado run), 1:34. H–Kaawaloa Shamblin 50 pass from Lind (Jesiah Malaikini run), 11:15. L–Jesse Sigrah 9 pass from Kahananui-Alejado (Sigrah pass from Kahannui-Alejado), 8:51. H–Lind 3 run (Malaikini run), 4:30. L–Kahananui-Alejado 10 run (pass failed), 1:52.